Stomach cancer is a disease in which malignant (cancer) cells form in the lining of the stomach. The stomach is a J-shaped organ in the upper abdomen. It is part of the digestive system, which processes nutrients (vitamins, minerals, carbohydrates, fats, proteins, and water) in foods that are eaten and helps pass waste material out of the body. Food moves from the throat to the stomach through a hollow, muscular tube called the esophagus. After leaving the stomach, partly-digested food passes into the small intestine and then into the large intestine. The esophagus and stomach are part of the upper gastrointestinal (digestive) system. The wall of the stomach is made up of 3 layers of tissue: the mucosal (innermost) layer, the muscularis (middle) layer, and the serosal (outermost) layer. Stomach cancer begins in the cells lining the mucosal layer and spreads through the outer layers as it grows. 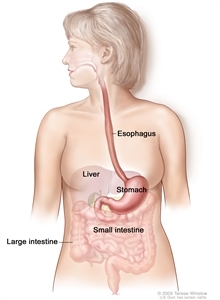 Stomach cancer is not common in the United States. Stomach cancer is less common in the United States than in many parts of Asia, Europe, and Central and South America. Stomach cancer is a major cause of death in these parts of the world. In the United States, the number of new cases of stomach cancer has greatly decreased since 1930. The reasons for this are not clear, but may have to do with better food storage and changes in the diet, such as lower salt intake. Older age and certain chronic conditions increase the risk of stomach cancer. Helicobacter pylori (H. pylori) infection of the stomach. Chronic gastric atrophy (thinning of the stomach lining caused by long-term inflammation of the stomach). Pernicious anemia (a type of anemia caused by a vitamin B12 deficiency). Intestinal metaplasia (a condition in which the cells that line the stomach are replaced by the cells that normally line the intestines). Hereditary nonpolyposis colon cancer (HNPCC). Having a mother, father, sister, or brother who has had stomach cancer. Having had a partial gastrectomy. Eating a diet high in salted, smoked foods or low in fruits and vegetables. Eating foods that have not been prepared or stored the way they should be. The risk of stomach cancer is increased in people who come from countries where stomach cancer is common. Clinical trials that study cancer screening methods are taking place in many parts of the country. Information about ongoing clinical trials is available from the . There is no standard or routine screening test for stomach cancer. Barium -meal photofluorography: A series of x-rays of the esophagus and stomach. The patient drinks a liquid that contains barium (a silver-white metallic compound) which coats the esophagus and stomach as it is swallowed. Photographs are taken of the x-ray images. The photographs are processed to make the organs easier to see and then made into a film. This makes it possible to see the motion of the organs while exposing the patient to less radiation. 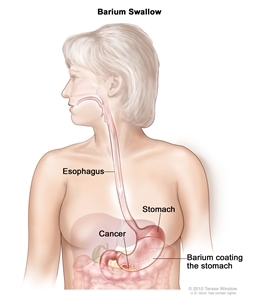 Barium swallow for stomach cancer. The patient swallows barium liquid and it flows through the esophagus and into the stomach. X-rays are taken to look for abnormal areas. 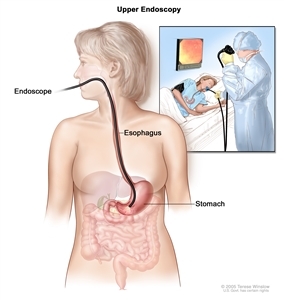 Upper endoscopy: A procedure to look inside the esophagus, stomach, and duodenum (first part of the small intestine) to check for abnormal areas. An endoscope is passed through the mouth and down the throat into the esophagus. An endoscope is a thin, tube-like instrument with a light and a lens for viewing. It may also have a tool to remove tissue, which is checked under a microscope for signs of disease. Upper endoscopy. A thin, lighted tube is inserted through the mouth to look for abnormal areas in the esophagus, stomach, and first part of the small intestine. Serum pepsinogen levels: A test that measures the levels of pepsinogen in the blood. Low levels of pepsinogen are a sign of chronic gastric atrophy which may lead to stomach cancer. Studies showed that screening a large number of people for stomach cancer using these tests did not decrease the risk of dying from stomach cancer. Older people with chronic gastric atrophy or pernicious anemia. People who come from countries where stomach cancer is more common. Finding stomach cancer may not improve health or help you live longer. Screening may not improve your health or help you live longer if you have advanced stomach cancer. Some cancers never cause symptoms or become life-threatening, but if found by a screening test, the cancer may be treated. It is not known if treatment of these cancers would help you live longer than if no treatment were given, and treatments for cancer may have serious side effects. Screening test results may appear to be normal even though stomach cancer is present. A person who receives a false-negative result (one that shows there is no cancer when there really is) may delay seeking medical care even if there are symptoms. Screening test results may appear to be abnormal even though no cancer is present. A false-positive test result (one that shows there is cancer when there really isn't) can cause anxiety and is usually followed by more tests and procedures which also have risks. Side effects may be caused by the screening test itself. A small hole (puncture) in the esophagus or stomach. Lung infection from inhaling food, fluid, or stomach acid into the lung. Severe bleeding that needs to be treated at a hospital. Reactions to medicine used during the procedure. This PDQ cancer information summary has current information about stomach (gastric) cancer screening. It is meant to inform and help patients, families, and caregivers. It does not give formal guidelines or recommendations for making decisions about health care.